Luis Gispert combines gold chains and glittering stone into sparkling abstractions, referencing the decadence of hip-hop and rock-n-roll culture as well as post-war abstract painting. 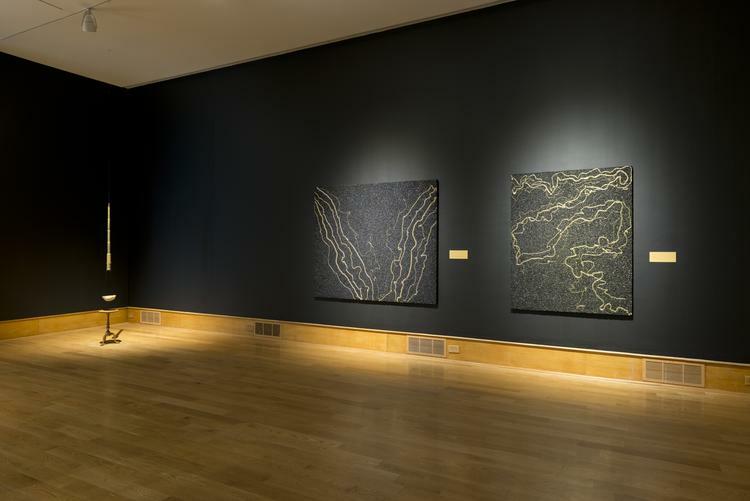 Inspired by the power of a hydraulic press, the artist created custom, asphalt-like canvases (made of painted gravel), in which gold necklace chains are pressured into distorted lines. Both metal and stone are polished to a high shine, resulting in dynamic patterns of gold on black, resembling lightning strikes or cosmic bodies in space. Zarina constructs paper works and prayer bead sculptures in gold leaf, referencing architecture and contemplative spirituality. The ornate designs and symmetry of India’s Mughal architecture, of which the Taj Mahal is the most famous example, particularly appeals to her. Following these influences, rich materials and references to buildings appear throughout Zarina’s work. Lalla Essaydi uses glittering gold-toned bullet casings to create garments and backdrops that refer to Islamic visual culture, which she then works into large-scale staged photographs. A strong metaphor for violence, the woven fabrics she creates are extremely heavy, literally weighing down the women in her pictures. She intends her images to raise questions about gender dynamics and cultural stereotyping. Teresa Margolles, an artist born in the Mexican state of Sinoloa, was trained in forensics and mortuary science. Her gilded fragment of a building destroyed in a catastrophic earthquake comments on commemoration and monuments of grief. Alchemy includes two bracelets from her Joyas series, which translates from Spanish to “jewels.” The gold-mounted stones adorning this jewelry are not gems, but shards of glass extracted from the bodies of people murdered in drug disputes. Danh Vo gilds cardboard refuse, reimagining simple boxes as sculpture. The cardboard shows the dirt and wear of commercial use, and the metal gives off the recognizable shine of genuine gold leaf, its soft surface melded to the textures underneath. Vo applied gold leaf to a Coca-Cola box purchased in Vietnam. Like the value of gold itself, that iconic logo, in its curving typeface, is recognizable across national borders and cultural divides. 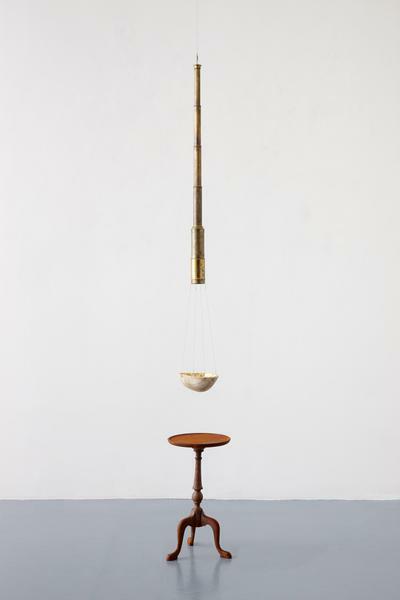 Rachel Sussman will install a site-specific work mid-way through the run of the Akron Art Museum’s presentation of Alchemy in homage to the Japanese tradition of “kintsukuroi,” in which ceramics are repaired with gold. Objects used in daily life naturally incur damage, and rather than disguise cracks and breakage, kintsukuroi honors repair as part of an object’s history. Sussman will “repair” a crack in the lobby with gold resin. Related photographs by Sussman will also be in the exhibition. Trained as a geologist, Charles Lindsay transforms salvaged aerospace and biotech equipment into his ambitious installations and sculpture. These circuits, retroflectors, laser-optic parts, and colliders, many of which are gold, take on new roles in Lindsay’s installation, Field Station. The artist imagines an outpost set up in a new world and questions what humans will bring as pioneers from Earth. Lindsay will transform an entire room in the Arnstein gallery into an immersive, futuristic field station. Other participating artists are James Lee Byars, Los Carpinteros, Catherine Chalmers, Dorothy Cross, Olga de Amaral, Don and Era Farnsworth, Laurent Grasso, Hank Willis Thomas and Shinji Turner-Yamamoto.